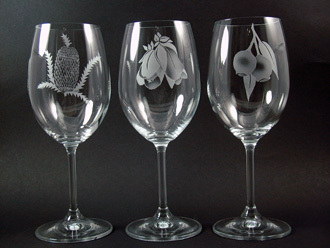 Glass etching is seen in both commercial and private settings. It may be lettering on an entry door to a public building or a decoratively etched entry sidelite in a private home. Similarly it can be seen as an etched logo on a decanter for a corporate gift or a stylishly etched wine glass on a wedding table. 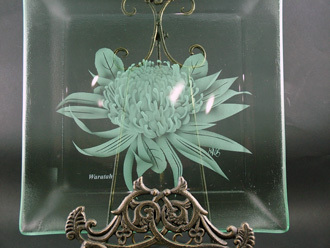 Etched Glass Design specializes in personalized original design and the use of sand etching as an art form for both architectural glass and giftware. The business is the creation of Lois Hewson-Brown with all designs and hand etching done by Lois in consultation with each client to produce an original piece tailored to the client's taste and style. Sand etched glass panel are used in commercial buildings and residential homes. The glass panels may be part of a privacy screen or a decorative feature in the particular setting. Lois designs and etches in all the traditional styles including Art Deco, Art Nouveau, Contemporary and Federation as well as more pictorial and modern abstract styles. 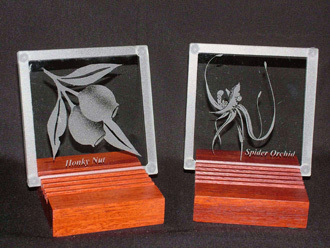 Each design is cut and etched by hand and observes the conventions of the chosen design style. Etched Glass Design is experienced in the reproduction of glass panels, particularly in the Art Deco and Federation styles. Glass panels can be recreated to replace broken panels or match the existing panels. 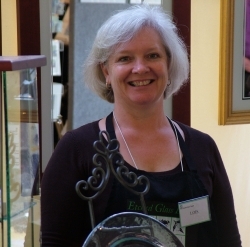 Lois has chosen specific glass pieces such as glass plates, vases and mirrors as a base in which to etch her detailed and often fine designs. There are often many hours taken in the concept and design phase along with the multiple stages of sand etching. This results in unique and beautiful art pieces which she individually signs. A bridal theme and text can be etched on champagne or wine glasses for the Bridal Party as a commemorative gift or bonbonniere for the wedding guests. Glassware can also be personally etched for other celebrations like anniversaries or birthdays. A logo or school crest can be reproduced with additional text to create a design to etch on to selected glassware for Merchandise, Awards and Trophies or giftware for Graduations, Commemorative events, Conferences and Presentations. 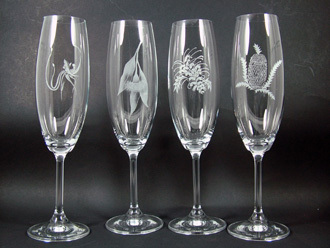 Lois has created a range of Wildflower designs and has etched them on a selection of glassware. While these designs are familiar, they are more botanically observant than the typically stylized souvenir genre.